20th August 2016 was Johnsonville’s big 50 Golden Years Celebration at Karori Recreation Centre. An enthusiastic crowd of around 150 people lined up for the Grand March, inspired by the music of five pipers and a drummer from the City of Wellington Pipe Band. RSCDS New Zealand Branch President David Williamson and wife Frances led the march, followed by Wellington Region President Philippa Pointon and Vice-President Melva Waite. Next came Johnsonville President and Tutor Kristin and Rod Downey, Johnsonville Life Members Aline and John Homes, and a hall full of dancers. What a magnificent sight that was, and how exciting to be caught up in such a festive atmosphere. Marshal Ian Simmonds kept us in order, handing over to MC Rod Downey as club members and guests formed sets for the first dance of the night. Spirits were high as we launched Johnsonville Club’s celebration of 50 Golden Years of association with the RSCDS. And they continued to rise as we danced many of Johnsonville’s old favourite dances to the rousing music of Peter Elmes’ band of Aileen Logie, Don McKay and Lynne Scott, with Hilary Ferral joining in. This occasion was all about people. It was an opportunity to recognise all those who had contributed to the Club across the last 50 years, and a chance to bring them together for a night of dancing, music, fun and friendship. Club President Kristin Downey searched club archives to identify and track down many of Johnsonville’s past tutors and office bearers. It paid off on the night with a total of 14 past and present tutors attending – from 1968 tutor Garry King to current tutor Rod Downey. To recognise their contributions, the Club presented tutors with flowering golden polyanthus plants. Appropriately, the presentations were made by some of the 20 past and present office bearers who attended. The earliest office bearer who could be with us was Sally Tunley, Club Secretary in 1971 and the most recent was this year’s new Club Secretary John Munro. Of course tutors and office bearers are not the only people who have given their time and energy to the Club. There have been many committee members over the years who have helped manage the Club’s affairs – so many that tracking them down was just too difficult. However their contributions were also acknowledged. They ensured that we are still here today, with a rich club life, an amazing collection of music and dance books, sound equipment, a club badge, tablecloths, tartan bunting, and members. And it goes without saying that a club is only as strong and successful as its members make it. On the night, past and present club members wore name badges displaying their club role/s, and years of membership (to the best of our knowledge). It was a special treat to have Lynne Hudson present. 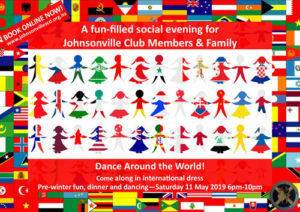 She joined the club as Lynne Jones in 1960, remaining with the club through till the early 1980s, becoming Lynne Macintyre along the way and bringing her children to dance at Johnsonville. It was also a pleasure to welcome our newest member, Tao Meng, who had only begun dancing in July. A very special element was the video display of archival photos created by club member and Past President Loralee Hyde (with technical assistance from John Patterson). We gathered round the screen to view photos and relive memories from club, region and branch events across many years. Our photographers (and more recently videographers) past and present have contributed much to our club community, and we now have a fine visual resource of club history. Two sets of young dancers connected our past and present when they danced Short and Very Sweet for us – a dance written by current Tutor Rod Downey for well-loved former member Isla Norris. Isla and husband Eric were longstanding Johnsonville club stalwarts and our first life members. Isla served as president from 1968 to 1971 and as supper coordinator for many years. She sewed our club tablecloths, and with husband Eric designed our club badge. They both welcomed and supported new dancers, some of whom still dance with us today. Thanks to Elaine Lethbridge for bringing together those young dancers from Newtown Juniors, Tawa, and Lower Hutt Clubs to add so much to our night. Then it was time for our 50th birthday cake to take centre stage. A trio of Presidents (Branch, Region and Club) cut the cake, and it was back to dancing. There were so many people who made our night extra special. Club member Shelley Hancock could not be there on the day, but she baked the Club birthday cake nevertheless. Past President Catherine MacAulay travelled from Whangarei to be with us. Many past members came along despite no longer being able to dance as once they could, and we did appreciate that so much. Last, but in no way least, this would not have been such a grand affair without the support of dancers throughout the Wellington Region and farther afield. Thank you all. There were also those who could not be with us. Two people especially must be acknowledged – former Tutors Glenys Mills and Marjorie Crawford who each taught the club for 14 years. Glenys taught between 1968 and 1981, Marjorie between 1970 and 1996. Together with Rod Downey who is in his 20th year of teaching, they were primary tutors of the club for a total of 48 years, and the Club rests on their shoulders.